← Is Curt Schilling a Hall of Famer? I found out that the Sox have seven all-stars in the Monday morning Boston Globe, which I had to drive six miles to buy. And I heard Manny Ramirez tie the game in the 8th inning with a home run on Tuesday night via a small, black transistor radio, the AM station maddeningly fading in and out during the most crucial pitches of the game. 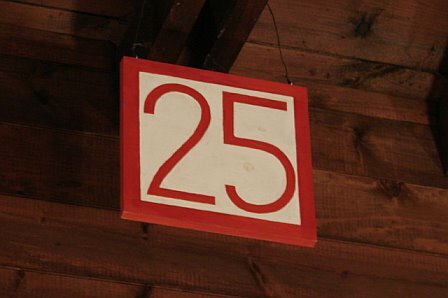 I’m on vacation deep in the woods of Northern New England in a non-winterized cabin that has a section 25 sign hanging from the rafters (commemorating my family’s favorite standing-room-only location). Without Internet, cell phone, or TV access, following t he Red Sox is a whole different ball game up here. Down in Boston, it’s all about NESN and your couch. You watch the pre-game show, you watch the game with Remy and Orsillo, and you fall asleep either during or right after the post-game show. The sports sections in the morning papers are read more out of habit than anything else, and few new nuggets show up there that weren’t shared by Tom Caron, Eck, Lou Merloni, or Kathryn Tappen on Sportsdesk after the game. But up here in the woods, following the Sox is all about two things: 1) Getting good reception on your radio (and having a backup station that carries the Sox in case your #1 choice fades out), and 2) Driving to the nearest gas station soon after waking up in the morning to buy the Boston papers, and hoping they’ve been delivered to the gas station before you get there, and then hoping that th e late scores made it into the local editions. When I’m in a remote place like this, it seems like a miracle when I can find the game on the radio. There’s something about hearing the familiar voice of Joe Castiglione crackling over the airwaves that gives me goosebumps and plasters a big old smile on my face. And I get the feeling that Joe KNOWS he’s broadcasting all the way up here to my distant location, that he KNOWS how important his responsibility is: to bring the pictures of the game to life for all of us fans who are stranded miles and miles from Fenway Park (or even from a town with a stop light). And reading The Boston Globe and The Boston Herald sports sections takes on a whole new meaning when I’m up here. Driving to the nearest gas station at dawn to buy the newspapers is as much a part of my morning routine as a cup of coffee. It’s pure joy when I see the pile of crisp Globes and Heralds sitting there next to the counter as I walk in the gas station convenience store’s door. The cash register lady charges me a buck-fifty for the pair, and I’m grateful that she has no idea she could charge me twenty bucks. Sitting in my car in front of the gas station reading about the Red Sox, and the box scores of other games, is truly one of the day’s highlights. I do love this “information era,” where news comes at us moments after it has occurred and we can follow every baseball game simultaneously on Baseball Tonight, ESPN.com, or MLBtv. I mean, I REALLY love the information era. 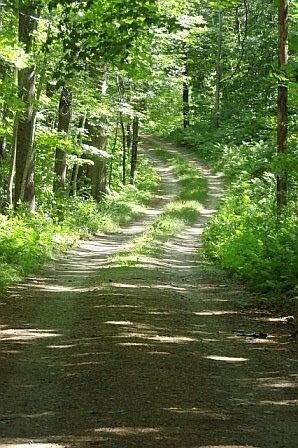 But for this Boston baseball fan, there’s a singular pleasure that comes from getting away from TV and the Internet (and the chattering argumentativeness of our sports radio talk shows) and being a baseball fan in the middle of nowhere, surrounded by trees at the end of a mile-long dirt road. I guess it forces me to become an even more active fan. Listening to the games on the radio requires more attention and involvement that watching the TV. Every three minutes, the radio voice of Castiglione or O’Brien or Arnold rises in excitement and we all yell Shhhhhhhhh! and lean our heads towards the radio, holding our breath, “seeing” the game in our heads and hanging on the announcer’s every word. 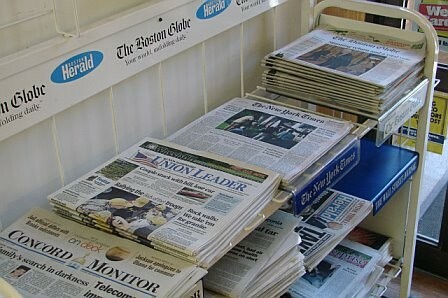 Likewise, gleaning information and analysis from the NESN pre-game and post-game shows – or from the newspaper sitting on your front step — is passive compared to the deliberate act of driving six miles to the newspaper store and the active process of reading Masserotti’s and Shaughnessy’s and Ryan’s columns – I mean, really reading and savoring them, in the same way one would savor a hot meal cooked over a campfire after hiking 20 miles in the rain. 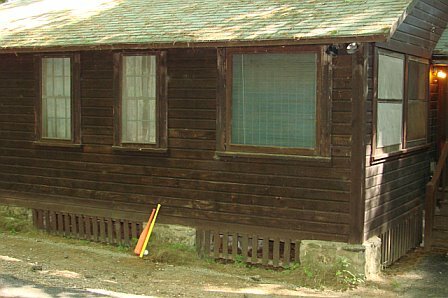 It’s almost like I came all the way up to this cabin in the woods to enjoy the sublime experience of following the Red Sox in the “old school” way. This entry was posted in Baseball, Red Sox Nation, Sports and tagged radio, Red Sox, Red Sox Nation. Bookmark the permalink. Did you see the article in today’s Globe about listening to games on the radio? They must’ve read this blog! Go Sox! outoftheway camp! Except a mother, a father or a kid. Really good! Hey Rob – have a great vacation! 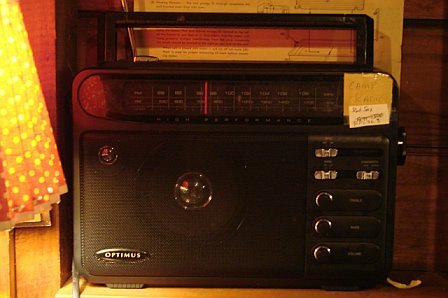 The radio thing (and I love Sox on the radio…it’s peaceful; so much calm rhythm) and the fact that you’re in the woods reminds me of Stephen King’s “The Girl Who Loved Tom Gordon” – did you ever read that? As V.P. of Red Sox Nation I know you get the final vote along with the RemDawg for Governors so I am going to give myself a shameless plug. I am a high school teacher in California running for Governor. I have been a huge Sox fan ever since growing up in Needham, Mass. I moved to New Jersey (Yankee land) during high school and had to carry the torch for the nation in enemy territory. I now live in California with my wife (from Pittsfield, Mass) and my 2 kids. My son was born just after the ’04 World Series and we gave him the middle name “Fenway.” This year we had another child who also coincided with a Sox World Series. I have been to Sox games throughout the country and even traveled to Denver for game 4 of the World Series. I am the founder and editor of http://www.fenwaywest.com to try to give a Western prospective to the Red Sox. I really appreciate your consideration. Keep the Faith.